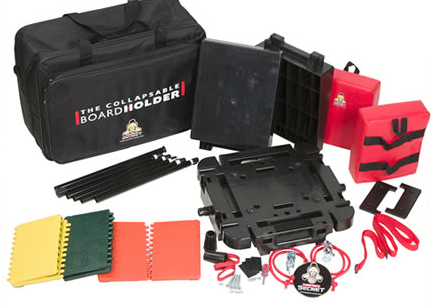 The Ultimate Martial Arts Board breaking experience in one package. You get all 7 different breaking strength rebreakable boards, re-combinable to make 13 levels of breaking, plus our Gorilla Board Holder and all mounting hardware. Mount on a wall, strap to a heavy bag, stand on the floor, or with partner holding. Adjusts from 1' to 6' with poles. Tilts for angle breaks. Choose non-padded or padded boards for extra grip. There has never been a better or more complete package than this to boost your breaking power.